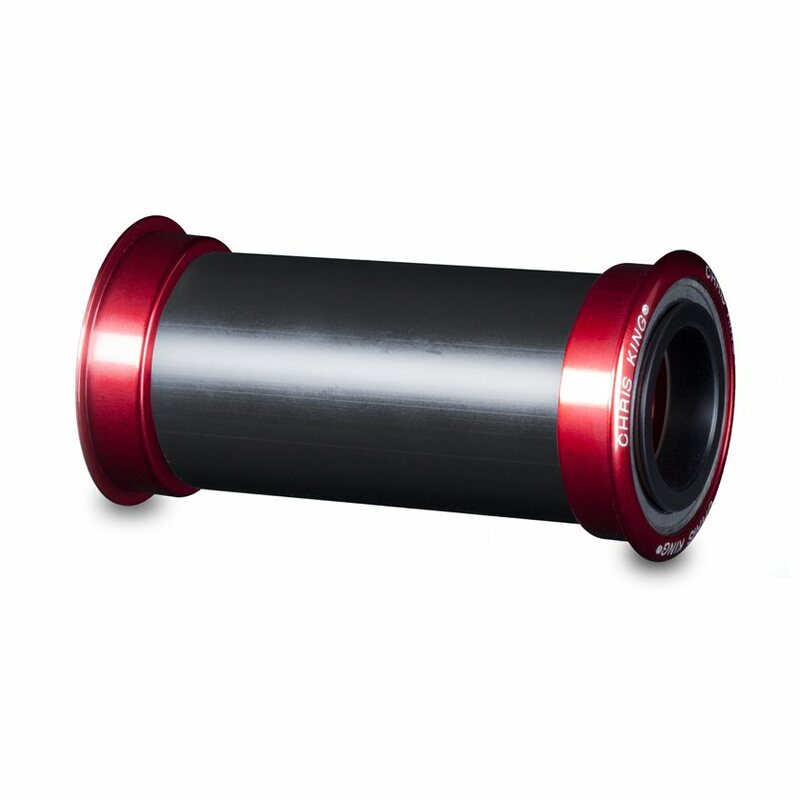 Chris King Press Fit bottom Brackets offer the same precision craftsmanship and high-performance construction as their very popular Threaded Bottom Brackets. Chris King prides their bottom brackets on the steel sealed bearings which are authentically made in-house. The meticulous process of crafting the signature bearings ensures uncompromised durability and smoothness. The ingenious angular contact bearing design allows the bearings to adapt as they are broken in, to prevent elongated wearing. The Chris King Bottom Bracket is easy to reapply grease and flush, with the use of a Chris King injector tool (sold separately). The Chris King Press Fit 24mm Bottom Bracket fits 24mm road cranks and 86.5mm bottom bracket shells, 24mm mountain cranks and 89.5mm bottom bracket shells, or 92mm bottom bracket shells. 86.5mm shells with 24/22mm road cranks will require Chris King's Conversion Kit #7, while 24/22mm mountain cranks with 89.5 or 92mm shells will require Conversion kit #6 (see compatibility chart below). Chris King Press Fit 24 fits 24mm spindle cranks like those offered by Shimano®, Rotor®, and FSA®. Bearing seals designed to work with our BB Injector Tool allowing you to easily put new grease in your bottom bracket bearings. Easily inject your choice of grease for different riding conditions. Its King so it's super smooth, reliable and noticeably better (and more expensive) than anything else. King bearing are the best out there and there is a reason I'm on my 3rd King BB. I still have and use my other threaded BBs but I have a BB82 on my new ride so I had to order these. The quality of bearing is surprisingly noticable even compared to new alternatives. They are serviceable and come with a great warranty. After 2 years of use I've only had to clean and re-lube this BB ones and still spins smooth. The cups dont seem to creek like other bearings. My Hope BB did creak prior to these and these ones never do. -annoying to figure out what "fit kit" is necessary for your cranks. Another amazing product from Chris king. Easy install and great bottom bracket thus far. Spins nice and can handle hard riding. I go through B.B. bearings like crazy but not with the Chris king. Highly recommended. I am a bike mechanic at a bike shop and don’t recommend installing if you don’t have the correct tools. Your lbs should have no problems pressing it into your frame. Will the press fit work on 2014 Pivot Mach 6 BB 92 PF? BEST ANSWER: I’ve got one on my 2016 429SL (PF92). Depending on what cranks you run, you might need to buy a separte CK conversion kit. The RF SL cranks use a 30mm spindle. The CK Press Fit BB is for 24mm spindled cranks.